Mistral boards....... wot no website? I want to look at the current range of Mistrals but cannot find anything on the website. Is the only option to log into Facebook to see their products? I do not believe in Facebook or the easter rabbit so if fb is the only option i will give up on internet searching for mistral. 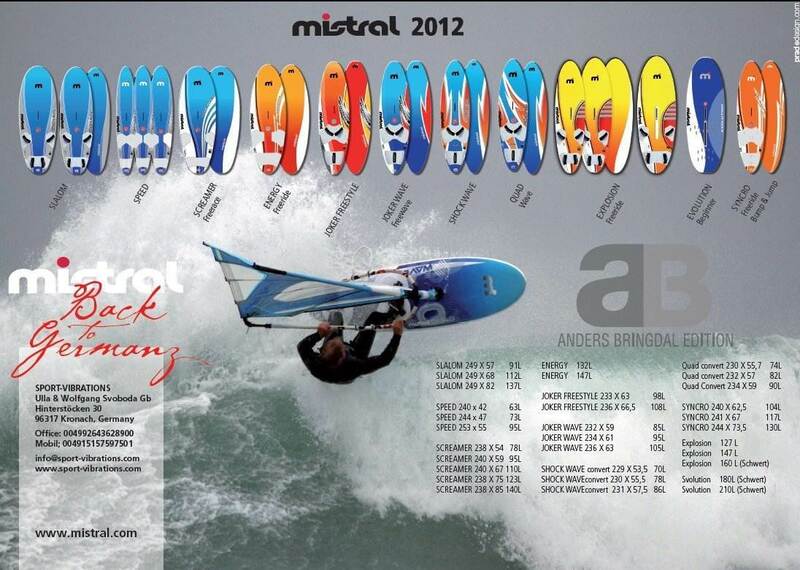 At Mistral, we are designing boards for maximum performance and on water enjoyment. Fitting industry trends was not something we considered in the design brief of the boards. The trend towards shorter boards started a decade ago, and was driven by performance in other disciplines of the sport such as freestyle, wave riding and super-cross, where the shorter outline and lower “swing weight” provide advantages for rotational manoeuvres. But a solution to one problem is rarely a solution for all problems despite how convenient the story might be.For high speed sailing activities in chop, these things are not as important as a stable waterline. When dynamic analysis is performed, a longer, flatter rocker is capable of lower drag, and significantly higher speeds in chop before stability is lost. In practice, shorter boards are balanced with higher rocker angles through the centre of the board to compensate the loss of aerodynamic lift due to the shorter outline. The aerodynamic lift in the nose generates an essential upward nose pitch to balance the rig forces.Although balanced on flat water in steady wind, it results in much harder chop impacts due to the higher angles involved. This is not only uncomfortable, but significantly less efficient as the board tracks the chop more aggressively and spends more time losing energy- making bigger waves. The higher rocker angles through the centre of the shorter boards mean that whenever the board is in contact with water in front of the front footstraps, a drag penalty occurs. This is especially noticeable exiting a gybe, where the shorter boards tend to bog down and stall unless you are powered up with your weight on the tail to keep this area of the board from contacting.If you try to (or need to) perform a step gybe, the board will catch and throw you over the front. The longer, flatter rocker of the Mistral boards allows a much larger standing area on the board before this occurs- meaning that you don’t have to have a perfect gybing technique to come flying out of the gybes every time. Improved gybing exit speed, early planing, and stability/speed/comfort in chop are the three reasons to adopt a longer board with flatter midsection rocker. The rocker and outline combine for a harmonious balance that keeps the board flying and in control the whole time you are planing.Carbon fibre is a wonderful material, especially when used appropriately. Used excessively, or for the wrong reasons, the result is a stiff product with areas of stress concentration and high vibration transmission through the structure. In a sailboard the result can be a tooth rattling ride, with high susceptibility to puncture on rocks, pebbles and harness bars, and a high cost which has to be accounted for by cutting down in other areas, or selling with an inflated retail price. Full carbon board manufacturers discovered that by using a 45 degree bias on the outer skins it reduces the stiffness- by placing the benefits of carbon in a redundant orientation. This softens the ride to feel like a glass board, but has all of the disadvantages of thin carbon skins (brittle). Using carbon fibre over the entire product makes a convincing sales pitch, but is not optimal for outright performance.Our goal is to deliver the highest possible performance, and we have achieved that by engineering the structure from the ground up.We have developed a product using a matrix of different materials, including carbon fibre, to produce maximum durability to weight ratio so you spend more time on the water, and less time on the beach messing with ding stick. As a result, the Mistral slalom and speed boards are responsive, dynamic, and ultimately, comfortable and enjoyable to ride. SHAPE & PHILOSOPHYBeveled Double Concave Hull- unique beveled double concave design with parallel centre channel to minimize chop impact effects and reduce rail pressure, resulting in the smoothest ride on the market, without adding drag. The Slalom boards are easy to sail and can carry a wide range of sails.Chine Cutaways- 3 major benefits over conventional cutouts: increases active surface area when getting planing, loosens trim at higher speeds allowing higher maximum speeds, and acts as trim tabs when the board might otherwise be tail-walking. Results in an incredibly fast, stable and free trim on the water.Increased Length- longer available waterline for superior low speed performance, lull gliding, and gybing exit. Lower impact angles at high speed in chop for smooth, controlled trim in rough conditions.Parallel Outline- for cleaner chop penetration. Pin Tail- for snap turns and low wake generation resulting in lower drag.Advanced Rail Design- rail shapes designed for ultra-clean release resulting in a dry ride, but with deep engagement during gybing for a dependable, stable carve.Deck Concave- subtle use of deck concaves to stiffen up the deck surfaces without adding extra weight.Ultra Profile- Ergonomically engineered foot profiles- designed for maximum comfort when driving the rail in the most neutral position, and allowing for maximum steering range through the feet.Vario-Inserts- provides adjustable strap spacing to cater for use with boots, or bare foot riding, along with options for forward and rear placement and spacing catering for all shapes and sizes.Globally Matched Curves- Outline, rocker and bottom shapes are optimized in unison with advanced in-house developed 3D computer design software to maximize stability and performance over the largest range of conditions.Optimized Material Placement- composite matrix of the highest quality materials to optimize stiffness, durability, and damping so that you get the best possible sailing experience.